The Brit and I ventured out to lunch in downtown Walnut Creek taking a much needed break from shopping for a new car. We were exhausted and overwhelmed and needed hearty meal on the rainy day to bolster us back up for the battle against car salesmen. Broderick Roadhouse seemed like the perfect choice. 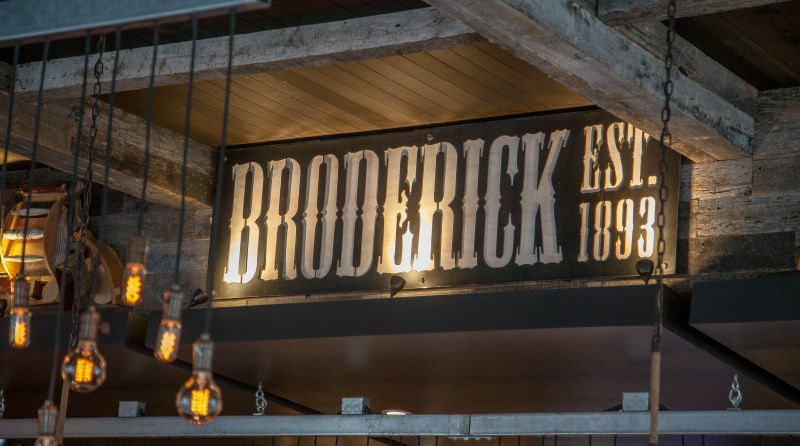 The Brit comments: The subtitle on the Broderick Roadhouse sign says established 1893. My, how time flies, I could have sworn that it was only eighteen months since I had eaten at a diner called Hubcaps in this very spot. A little digging shows that they have three locations, the other two being in Sacramento and that they started business as a food-truck, presumably horse-drawn if 1893 is truly when they started in business. We walked into a busy, funky bar/restaurant with a lively atmosphere. A table was quickly cleared for us, so we didn’t have wait much. I have to say that the seating was a little too close for my comfort; I didn’t have any room to put my purse and my camera case next to me. We also had to move out the table just to be seated as it was all so tight. Having people next to us on both sides so close wasn’t really comfortable for anyone. I felt like I was in the middle of other people’s conversations. Broderick Roadhouse isn’t a place where you would go for a romantic lunch or dinner. This is a fun place for foodies looking for a good casual meal out. Our server Jake was very personable and very knowledgeable about the menu. I liked how he described the menu items and gave tips on how to order the food to get the best flavors. It is rare that you get a waiter who cares that much about how their patrons might enjoy their food. It was refreshing. He was also attentive and our orders were delivered promptly and hot. Great service Jake! The Brit ordered an AZ-87 cocktail. It was presented beautifully with a large orange peel twist. 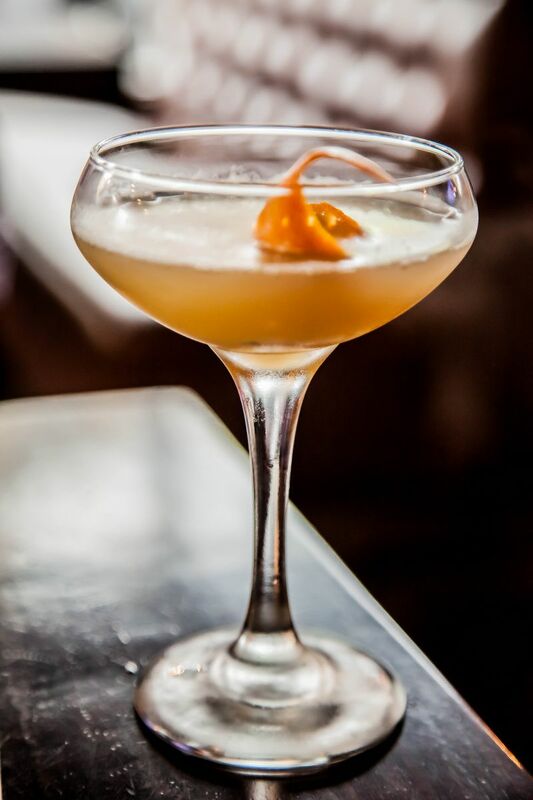 The Brit comments: The cocktail was a twist on a whiskey sour; using orgeat to sweeten it and with the addition of bitters. Whilst I enjoyed the drink, the taste was dominated by the lemon and rye; the result a drink that colour aside was indistinguishable from a regular sour. I ordered a cup of coffee with a side of Baileys. I wanted something warming and lush to combat the cold rainy day. It was a good choice as I felt I was coming down with a cold. We then ordered our food. I ordered the Crab cake with eggs Benedict; The Brit ordered the duck burger cooked medium rare. As per Jake’s suggestion, I ordered my hollandaise sauce on the side and not covering my plate. Our plates arrived and I have to say I was sorry I didn’t order the duck burger too. It looked absolutely amazing. A huge burger with a crispy cheese round and finished off with a spicy sweet pickle. Wow! The plate was also filled with fries. My mouth watered as I took my photographs. 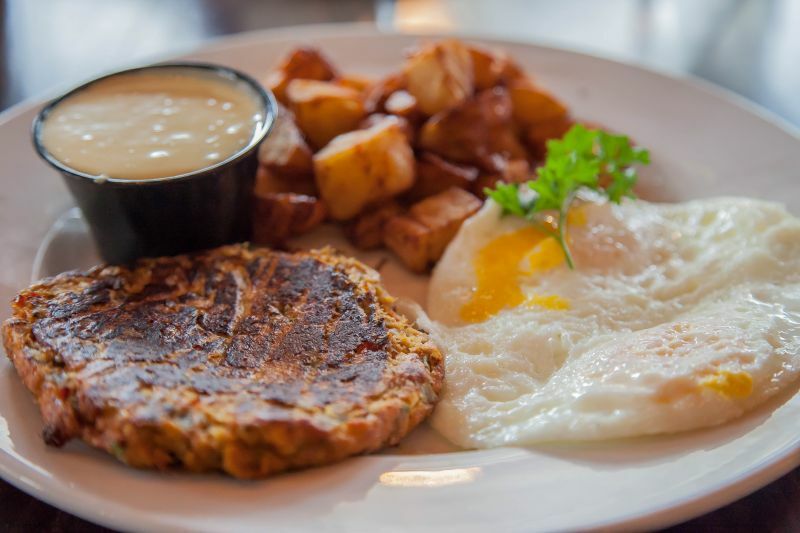 Looking down at my own plentiful plate, there was a large-sized crab cake, home fried potatoes and two over medium eggs with a side of hollandaise sauce. Taking a bite of the crab cake, it was a bit spicy and rich and oh so good. The eggs were cooked perfectly. The hollandaise sauce was delicious. It was creamy, buttery and a little lemony. Perfect. The only disappointment on my plate was the potatoes. They were a little over salted and definitely had more of an herb flavor than I liked. Overall my plate was delicious and filling and I would order it again. I might substitute the potatoes for fries though. The Brit was making moaning noises from his side of the table. I asked him for a bite of his duck burger and he seemed a little hesitant to share. The whole thing looked so good, I just knew it was going to be outstanding. I did get my bite and I was wowed. 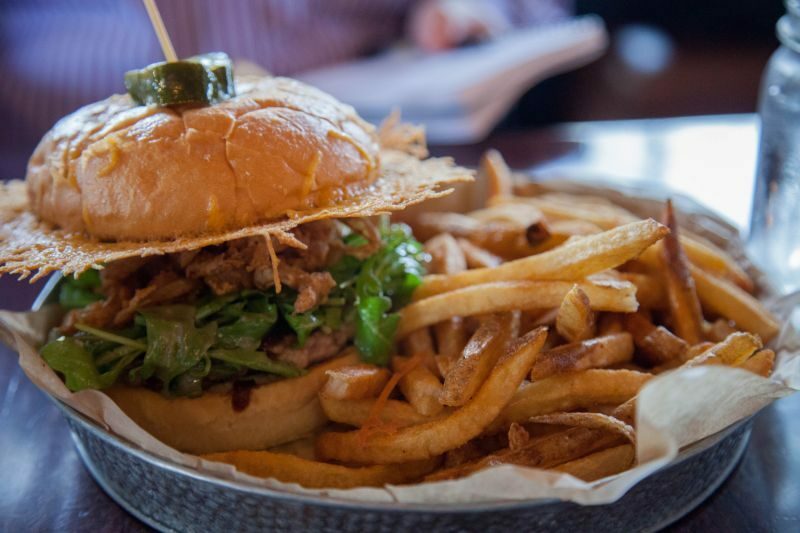 There were so many layers of flavor to that duck burger. The meat was tender, juicy and flavorful, the crispy cheese gave it both salty/crunchy texture, the bun was slightly sweet, and the mixed leaves were that perfect bit of earthiness. On top of the bun they had placed a slightly sweet and spicy pickle slice. The whole bite together was great. The Brit comments: The burger was cooked just as I had requested. The flavour and texture were balanced to perfection. This is one of those dishes that offers a conundrum; when I go back do I order this again as I loved it so much, thus preventing me from exploring other options. To finish out our wonderful meal we ordered what is basically an ice cream sandwich. 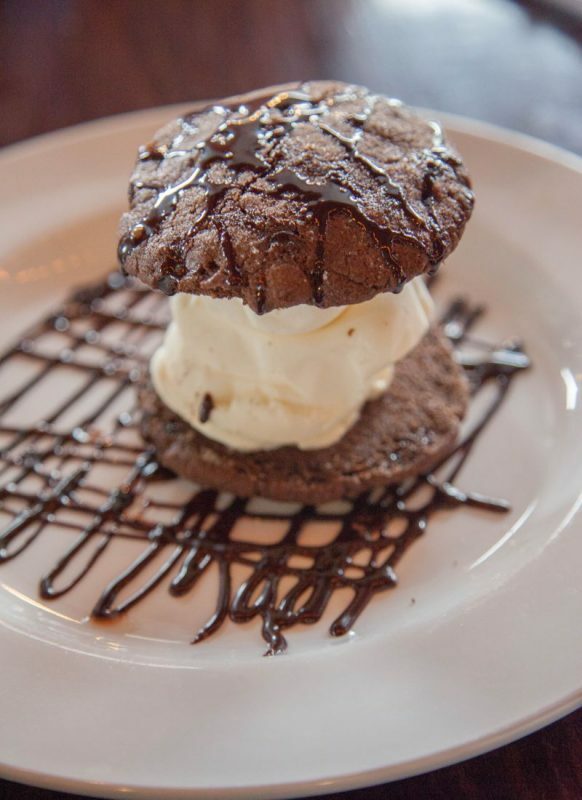 However, be warned that this isn’t your typical ice cream sandwich. 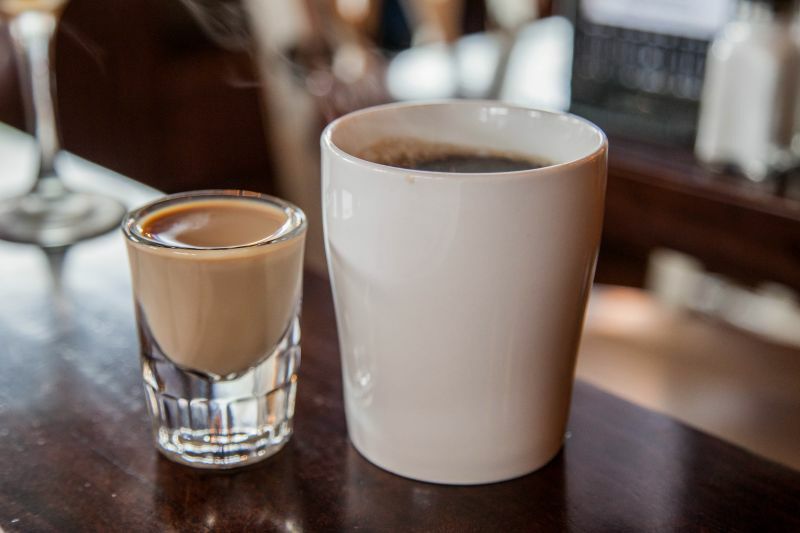 No, this one is for adults only with its complex and spicy flavor. Although the cookies are technically chocolate, it is the ginger flavor that comes to the front of the palate and a kick of spicy pepper to finish. The chocolate is showing up somewhere in the mid-palate. The vanilla ice cream gives the cookies a cooling sweetness that tones down any sharpness from the spicy peppers. Chocolate sauce is drizzled over the entire thing to add richness and decadence. The whole thing together is outstanding and innovative. We were both really impressed with what we ate. It is a large portion so it is perfect for sharing. 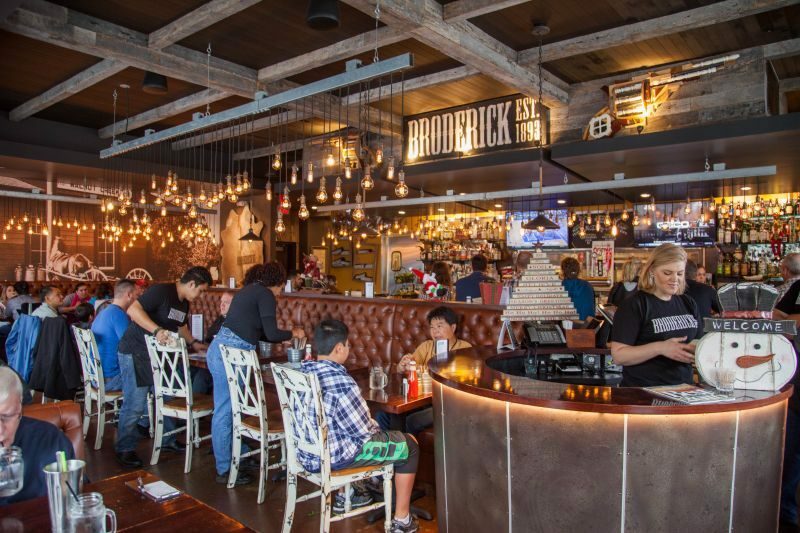 The Brit comments: In summary; Broderick Roadhouse is an excellent addition to Walnut Creek’s downtown dining options; it offers casual food with a twist and based on our visit does so with excellent flavours and service that exceeded our expectations. The Brit comments: As a postscript, I feel compelled to raise one concern. The menu included several boozy shakes; milkshakes with alcohol added. These sounded like an interesting idea, but I was disappointed to see an offensively named item on that part of the menu: “A car bomb”. This used Jameson and Guinness. As I am British and remember the horror of car bombings, this hits close to home. I am shocked that making light of so many deaths in a racist manner is considered acceptable.